Amenia, before we came up from Brooklyn, used to be the home of a great old cinema, or so they say, that opened in the 1950s. Folks would flock from the Hudson Valley for their getaway or from nearby Connecticut to the east and according to one local who grew up in the late 60s, early 70s Amenia was also a hopping place to hear live music and dance the night away. All that was gone; the cinema burned down in 1974, and where it stood is now a parking lot for the Amenia Public Library. Until this past July, one had to drive north ten miles, to Millerton, to the Moviehouse to catch a movie. Then Four Brothers, a local restaurant that for 35 years has beckoned to folks on their way up and down Rte. 22, decided it was time to bring the drive-in theatre back! Open April thru October, Amenia Drive-in Theatre boasts a 56’ wide screen (770” diagonally to you contextualists), and rolls the reels (well not really) after sundown on Friday, Saturday and Sunday. For $7 each person over 10, your carload can tune into a local FM radio station (bring your jumper cables) and sit back to catch two full-length movies (7:15 and 9:30 PM) such as the current fare: “Smurfs2” and “We’re the Millers,” alternating with “The Getaway” this past weekend. 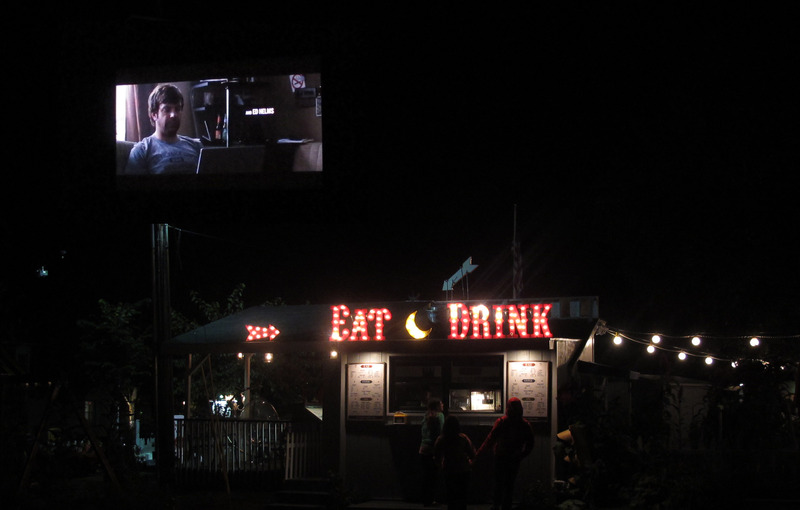 Four Brothers, according to its website, bills itself as the oldest full-service restaurant in America hosting a full-sized Drive-in Theatre. The food they serve is definitely better than the old snack shack at the drive-ins I frequented in my youth, and young kids who are accustomed to drive-thru’s might get a kick out of the nostalgic night life of Amenia. The Drive-in is down the road barely a mile, and if you didn’t come all this way to sit in a car and watch a blast from the past, then order a pizza out and come sit on Hilltop House’s verranda. This time of year there’s generally a nice breeze and you can tune in your radio and listen to the movie Orson Welles style. Labor Day, that harbinger of back-to-the-books, came and went early this year. But what was once a major weekend in SCCA (Sports Car Club of America) racing at Lime Rock Park (our local racing venue) has moved back to the weekend of September 21st and 22nd, so you can still catch it! Or better yet, the phenomenal Grand-AM Rolex Finale the following weekend September 27th and 28th. 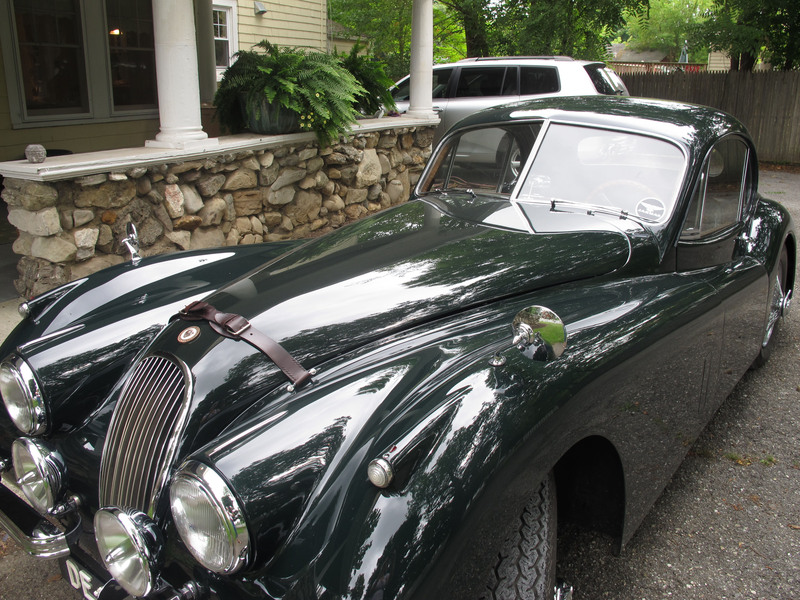 Labor Day at Lime Rock is dedicated to heritage vehicles with a parade in Lakeville and an Historic Festival, so when one of our guests, a race car driver pulled up in this Jag, it jogged my memory for racing!!! Back in the day when the late Paul Newman starred in his own racing team, Lime Rock Park was the actor’s home track, and he made it home, truly. Lime Rock is homey and very much a park: with its natural terrain track looping through seven turns in the Berkshire Foothills of Lakeville, CT, it’s about a 20-minute drive northeast from Hilltop House. Fans view the races from the grassy infield hills, staked out with armchairs and coolers placed as one so chooses. Lime Rock’s 1.5 mile track first opened in 1957, “the first road racing track to be engineered and designed using scientific and highway-safety principles,” by the aeronautics department at Cornell. The track was repaved in 2008, by owner Skip Barber, who meticulously maintained the track’s integrity. Lime Rock is one of the most popular sites of the Skip Barber Racing School, though Barber sold the school a decade ago. The school races a fair part of most weekdays at Lime Rock. Friday-Saturday race weekends are frequent at Lime Rock, with a schedule that spans March through November, and many weekends are open to the less well-known SCCA that pre-dates Lime Rock’s heritage. It’s interesting to note, that come Sunday, you can hear the Litchfield Hills whisper in Lakeville: by standing court order, no racing graces the town, so you might want to check out the many pristine and serene options in Connecticut or the Oblong Valley before you head back to work and the books come Monday morning.